B1 - Rhythmology (Remix) epic tune, has that classic urban shakedown, some justice sound. B1 also samples the outro beats of Run DMC`s - "run`s house" from the album "Tougher Than Leather"
Huge Tune, One of those tracks that the moment you hear it you know you are in for something special ! From its string intro, followed by the piano loop and funky breaks to an awesome bassline, topped of with the vocals, youcan see why this was such a big track and why there's so many releases and mixes. I think the Re-make takes it for me. Fantastic track with a lot of happy memories. Nice remix (one vocal, one dub) of this House classic by Altern 8's Mark Archer... takes a subtle touch & adds his own spin to this wicked track. 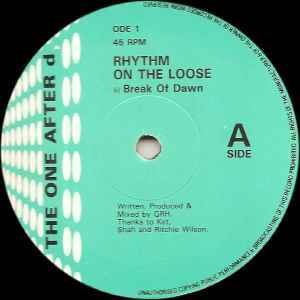 'First Choice Let No Man Put Asunder'.As soon as I was back home,the hunt started.The A side,Break Of Dawn (The Cyclone Remix)is a great break-beat track which I liked playing a lot.It has a great bass line and a cool break.